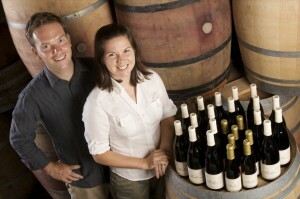 Mail & Guardian has just released its Top 20 Wineries List and the Mullineux Family have made it to Nr 10. This is an unbelievable achievement as Chris and Andrea have only been active for a few short years. We are so very proud of them. It is also a tribute to them as a couple that they not only have time to produce a fairly vast range, including a few under the Three Foxes moniker, but that they have also welcomed a new addition to the Mullineux Family – Phillipa, the most gorgeous baby girl, sister to the fast-growing JZ. Chris and Andrea are not only good friends, but also neighbors in Kloof Street, Riebeek Kasteel. This is of course also the name of yet another release by them and the site of the new Augusta venture, Augusta Extra Vierge our self-catering country house which will be complete and ready for guests by mid-May. A nice-to-know details is that should you be staying in the Extra Vierge house, a tasting of Mullineux Family wines can be arranged in minutes, and if Chris or Andrea are around, they will probably to the tasting themselves. Make a note of the 2012 Swartland Revolution, on 9 and 10 November 2012. Over the past 15 years the Swartland region has grown in stature and complexity and today there are enough contrasting wines to showcase this diversity over a weekend. The aim of the revolutionary weekend is to raise general awareness of the area, and although there might be stylistic and philosophical differences in the wines to be showcased, they all share a common sense of place – as with all great wine regions of the world. The weekend includes the BIGGEST names in SA wine: Sadie Family wines, AA Badenhorst Family and of course Mullineux Family, Sequillo (Eben Sadie as well) and Porseleinberg. Stay at Augusta Extra Vierge if you want to attend the weekend! The first stirrings of a revolution in South African wine became noticeable around the time that Nelson Mandela was inaugurated as president. Suddenly, Cape wine could creep out from under its stone and find a welcome in the wider world — and learn in that brighter light what was wrong with itself and even, a little, what was right. This set in motion a remarkable process of change, of extraordinary and exciting developments in the wine industry, even if the social aspect lagged somewhat. In 2001, in the context of the early years of the wine revolution, Tim James conducted a poll of local wine professionals to establish a top 20 list of producers. Continuing change meant new entrants to the game and ever-shifting reputations, and it was worth repeating the exercise in 2003, 2006 and 2010 — and again now. This is not a definitive list — how could it be, especially when the number of producers and brands has doubled in the last decade or so alone and no one can regularly monitor them all? But to make it at least plausible, Tim persuaded 29 professionals with different perspectives to do the poll: five sommeliers, five retailers, four eminent critics from Britain — South Africa’s biggest foreign wine market — and 15 local wine writers and judges. Each submitted two lists, one giving, in any order, their top five wineries and the other listing another 15 to give an overall top 20.